HomeFor ClientsAnalyticsForex Analysis & ForecastsForex Technical analysis and forecastsForex Technical Analysis 2011/03/11. EUR/USD,Dollar Index, GBP/USD, USD/CHF Forecast FX. Forex Technical Analysis 2011/03/11. EUR/USD,Dollar Index, GBP/USD, USD/CHF Forecast FX. As it is seen from the eurusd analysis the EUR/USD currency pair keeps moving downwards. By the moment the pair has completed symmetrical pattern, and one can consider buying it only after the price leaves the descending channel. 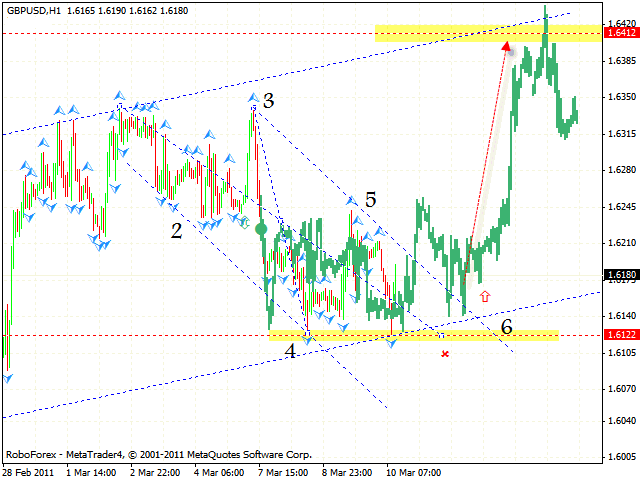 The target of the growth is still the area of 1.4135, however, there are some signs of a trend reverse. 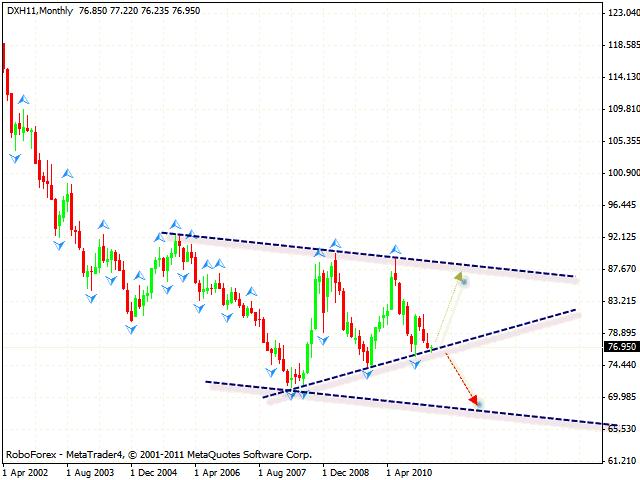 Dollar Index was supported by the “triangle’s” lower border at the weekly online forex trading chart. There are two possible scenarios. 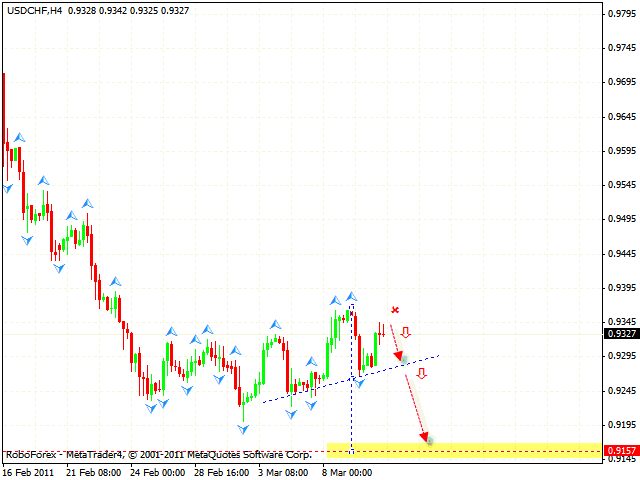 The first scenario is the breaking of the “triangle” downwards with the target of the fall in the area of 67. The second is the price growing to the “triangle’s” upper border. Pound has also completed symmetrical pattern, but one is recommended to buy the pair only after the price leaves the descending channel. The stop must be behind local minimum. 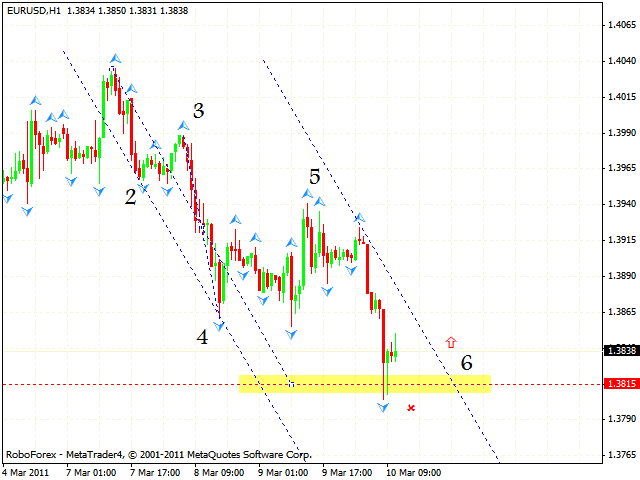 According to the gbpusd analysis the target of the growth is the area of 1.6412. In case of Franc the situation is simpler. We have “head & shoulders” reversal pattern forming with the target in the area of 0.9157. Judging by the technical analysis usd chf you can either try to sell the pair at current prices with the stop above 0.9365, or wait for the neckline to be broken and consider opening short positions.